Hi, I am interested in your 2006 Chevrolet Corvette (stock #4936-CHA) listed on Autotrader for $24,995. I'd like to get more information about this vehicle and confirm its availability. This 2006 Chevrolet Corvette is ready to become your future classic. It has all the right documentation, low mileage, and all the best features including a six-speed and magnetic ride control. Red Corvettes are so legendary that songs are written about them. So you know you need to have one that looks as good as this one. Averaging about 3,100 miles annually lets you know this has been more of a pleasure cruiser than a daily driver. The bright luster backs all of it up. But more than just look fast, this earns its Victory Red paint. The C6 understood aerodynamics better than any Corvette before it. The sleek shape has the right crisp creases to channel the air over the body, and you can see it all so well on this babied example. While this is an all-American, the return to exposed headlights behind smooth covers was clearly inspired by Ferrari (another famously red classic!) Black interiors have a long history of being the preferred choice for cars with power and style. The Ebony leather bucket seats are supportive and comfortable without being confining. This Corvette carries just about every option in the book, including a heads-up display, AM/FM/CD/XM Bose audio system with satellite navigation, dual power heated seats, and heated mirrors. You even have the glass targa roof for added distinction. 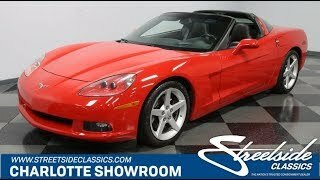 Plus there are a ton of great standard features in this premium Vette, including dual zone climate control, power windows, power locks, tilt/telescoping steering wheel, cruise control, keyless entry, and keyless ignition. But more importantly, because this is a modern classic, you get modern safety features like dual airbags, side air bags, and anti-lock brakes. It all seems like a practical sports car, right? Thats also why the C6 even comes with a decent amount of luggage space so you can fit your weekend bags with ease. The original LS2 V8 thats under the hood is still a motor that impresses plenty of people today. Rated at 400 hp right out of the factory, it makes more than the original C4 ZR-1! The LS-series of engines are terrific fuel-injected powerhouses, and you get to take full control of it thanks to the six-speed manual transmission. They even upgraded this one to a Borla exhaust so you get an even more impressive throaty soundtrack as you explore the higher rev ranges. They really did option this one to be a true sporting machine by also giving it the expensive Magnetic Ride Control. Its the kind of adaptive suspension that worked so well that even Ferrari borrowed it (see, theres more of a connection here than just the headlights!) But you dont have to drive it hard to enjoy all the benefits. The fully independent suspension, power steering, and four-wheel disc brake are great just for cruising, too. The sale comes complete with all the right paperwork, including the original window sticker, owners manual, service manuals, and warranty card. So no matter if youre a collector or a driver, this is the C6 you want. Call now!